Erik Estrada, postdoctoral teaching and research fellow in early and medieval Christianity, recently delivered a presentation to Wake Forest University faculty and staff on the subject of leveraging technology in teaching to foster student engagement. 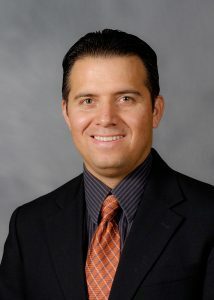 Estrada also recently participated in TechXploration, a conference hosted by Wake Forest University Information Systems. TechXploration is a symposium that brings together faculty and staff to share their experiences with current technology efforts. The event showcases how technology is being leveraged in teaching, learning, research, engagement, and creative endeavors at the University. Estrada and other faculty and staffer were invited by Mur Muchane, the University’s associate vice president for information technology and chief information officer. The title of Estrada’s presentation was “Engaging the Christian Tradition through Flipped Learning and Google Classroom.” In the flipped learning model, students complete digital assignments before class, perhaps through guided reading or video viewing, and use class time to discuss their comprehension of the material. As part of his implementation of the flipped classroom, Estrada often creates screen-capture videos introducing class readings, highlighting key passages in the documents for students to consider prior to class. In the classroom, Google Classroom and Google Docs foster conversation among students. “The opportunity for students to write down their thoughts and perceive in real time how their classmates are understanding a document gives them the confidence to express their perspectives,” he said. Coming away from the event, Estrada has learned about other ways he might incorporate technology into his pedagogy. Over the summer, he plans to research these methods and connect with other Wake Forest faculty and staff to discuss these options.